Seven's Sunday Night current affairs program just ran its profile on superstar Serbian Australian model Andrej Pejic - as tonight's lead story no less. Here is the video below, in case you missed it. As outlined last week, I worked closely on this story with the Sunday Night team, setting up all their filming access as they went in Paris and London. I also travelled to Melbourne for the interview with Pejic's delightful family: mother Jadranka, brother Igor and grandmother Danica. 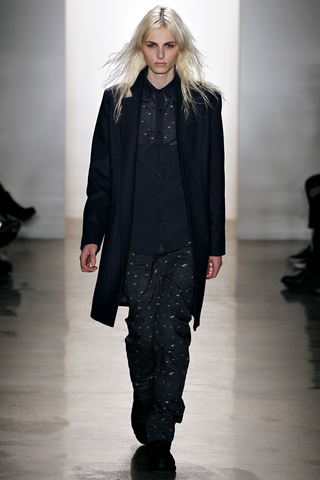 Andrej, meanwhile, has just touched down at New York Fashion Week, where he is booked for a number of shows. Some are straight menswear, as in yesterday's Richard Chai (above) and Robert Geller shows. However some shows and presentations are womenswear, such as Ally Hilfiger's presentation for her Nahm brand (below). And it seems he may be earning womens' modelling rates. Way to go.